A fleece with style? Oh yes, yes of course. The Longs Peak Vest is a Performance Sweater - the evolution of Sweaters as Gear. 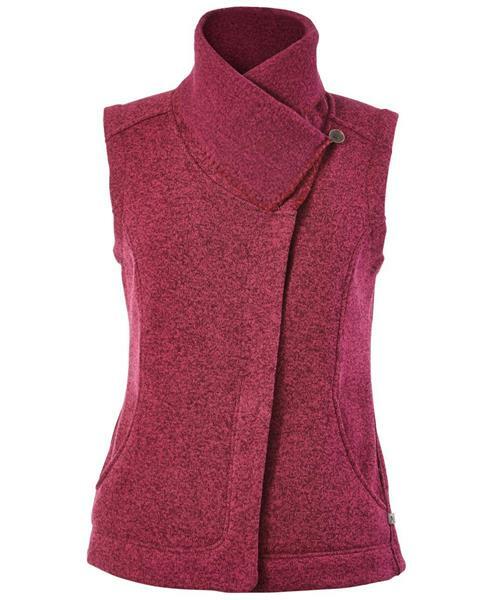 Its the warmth and quick drying performance of a fleece with a stylish asymmetrical front and wide shawl collar that you can wear folded down or pinned up for extra coziness. Whether it's as a travel vest, hiking layer, or for a night out, take the spirit of the outdoors with you everywhere. The most luxurious mid-layer fabric goes beyond sweaters and fleeces. This Italian-born blend takes the best properties of synthetics and wool and combines them for a stylish boucle with extra warmth and breathability.